4 Bedroom Semi Detached House For Sale in Windsor for Guide Price £900,000. With origins dating back to 1880, reputedly the old laundry house for the Manor House in The Friary, a largely extended 4 bedroom, 2 bathroom semi detached family home, offered to the market with no onward chain. Flexible and versatile accommodation on the ground floor includes a generous sitting room at approx 21 feet featuring a superb inglenook fireplace with log burner and views of, and access to the garden. A separate dining room and study both have front aspect whilst the conservatory sits open plan to the kitchen/breakfast room at the rear. The kitchen is well appointed with a breakfast area, quartz worksurfaces and integrated appliances including a double oven with warming drawer, dishwasher and washing machine. Four bedrooms are housed on the first floor including a superb master bedroom at 21 ft with Juliet balcony and en-suite bathroom. The additional three bedrooms share the main family bathroom comprising both a corner bath and separate walk in shower. 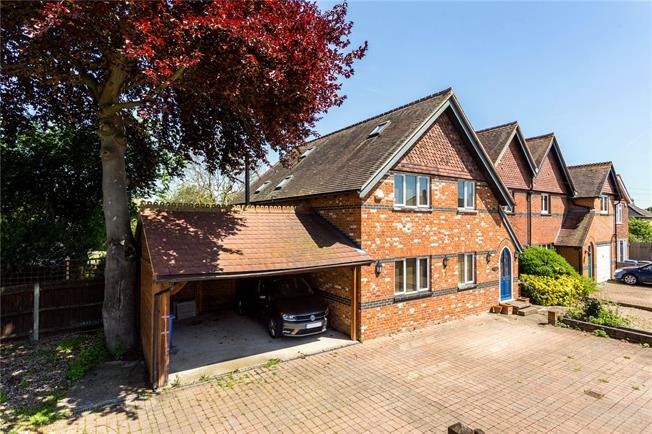 Straight Road is conveniently situated for access to local shops and restaurants, and is close to historic Runnymede and Windsor Great Park, with the larger town of Windsor just 1.8 miles away. Three train stations serve commuters: Windsor to London Paddington (via Slough approx 20 mins) and Datchet or Windsor & Eton Riverside to London Waterloo (approx 50 mins). Old Windsor has excellent road links, with the M25 J13 approx 3 miles away, M4 from J4 leading to the M25 and M3. An extensive range of well regarded schools are available in both the independent and state sectors, including St George's, Upton House, Queensmead School, Eton College, St John's Beaumont, Kings Court Primary, St Peters Middle School. In addition, there are school coach services from Old Windsor to St George’s Weybridge, Sir William Perkins School, Chertsey, Hampton School for boys and The Lady Eleanor Holles School for girls. The property is approached via a gated driveway providing parking for several cars and a carport with pitched roof. Side access leads to a mature rear garden mainly laid to lawn with trees, shrubbery and a raised part decked, part paved terrace with pergola. Other features include a timber summerhouse and a pond.